Parked early in the usual car park just north of Auchlean in Glen Feshie. The weather wasn’t looking too promising for today but was supposed to improve for tomorrow. Walked down the road to Auchlean and then continued down the track past the woods to the east of the river. The usual approach is to continue down past the ruined Carnachuin bridge then take the main track east but I’d planned a “short cut” heading SE just after the trees ended. If the weather had been better I think could have gone via Coire Garbhlach but the mist was down with no views into the corrie. Headed SW towards the Allt then steeply up the side of Meall nan Sleac. With only the occasional stop/start tracks and deep heather, this route was probably shorter in distance but not time- may be just as well to go the usual way. Got to the top of Meall nan Sleac but couldn’t see the top of Mullach Clach a Bhlair. As the clag and mist were down I decided to use as much of the main tracks as possible so as not to get lost. Followed the track NE via Moine Mhor to Allt Sgairnich. There was the odd clearing in the clag but then it closed over again – didn’t get to see much. I’d originally planned then to head east and follow the Coachan Roibidh down to Glen Dee (thanks to Border Reiver who helped with my query). 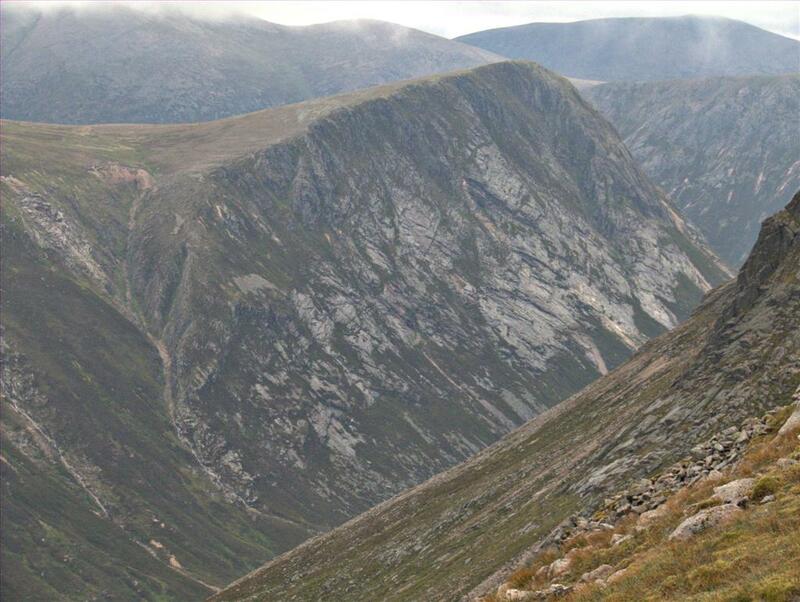 However, on passing at the head of Coire Cath nam Fionh it looked as though I could go that way instead. So, retraced my steps taking a detour to avoid the worst of the boulders down Beinn Bhrotain and headed back to the head of Coire Cath nam Fionh, dropped steeply down the corrie and followed the Allt into Glen Geusachan. I then followed the Geuseachan Burn down the glen initially on its south bank then crossed to the north. It was hard going with lots of ups and downs and I suspect it may have been easier to follow on the south bank. Headed up to Corrour Bothy where I cooked my dinner as it was now late afternoon. Met a father and son who were walking the Lairig Ghru. Had a long chat while I made my dinner. There the only two in the bothy and I thought about staying. However, I was planning a very early start and it wouldn’t have been fair to waken them that early so I decided to camp out. Turned out to be not the nest of decisions...midges again ! Found it hard getting a decent spot but eventually set up the tent close to the river. Left my rucksack and headed off towards Carn a’ Mhaim. Initially it looked OK so I headed steeply up its SW side..then the clag came down and I couldn’t see anything. Due to the low cloud and clag I decided not to try the direct descent so took a longer way back down towards Glen Luibeg. The light was getting low by this time with The Devil’s Point looking menacing in the gloom. The wind dropped completely over night. When I went out the tent at 4am I was hit by the largest cloud of midges I’ve ever seen. Bad idea wearing shorts – must’ve had over 100 bites on each leg. Jumped back into the tent, DEET can out and that held them at bay. Dead midges everywhere. Had an early breakfast and then decamped with my headnet on. The DEET seemed to be working. Over the bridge and headed towards The Devil’s Point. Could see clearly where I was going next so headed back down to the top of Coire Odhar before starting up towards the 1,213m mark. I now contemplated the return walk westwards. It hadn’t taken long to cover the first three hills since leaving the Lairig Ghru but the next bit would be harder. Headed westwards hoping to pick up a track at the head of Coire Dhondail but with no real success. Then followed a lot of ups and downs through the moraines south of Gleann Eanaich. Managed to find a track round the SW top of the corrie leading up to Sgor Gaoith. Clag still down so couldn’t see much. Got to the summit and met two other walkers with their dog. Mist didn’t look like clearing to I headed off back to the car. Over Carn Ban Mor and then back down the usual track. Seemed a very long way but the track was good. Had promised to be back for dinner and made it back to Coylumbridge later afternoon. Weather hadn’t been too bad all things considered. Want to revisit this area again but in clearer weather (with some wind to keep away the midges). A fine big walk in a terrific setting. Certainly something for everyone in and around both Lairigs Heading there in September,hopefully, camping near the same spot as you- so long as the midges don't bleed me dry . Havnt done these yet either so gives me ideas. We seem to be in the same areas just weeks/days apart. Another epic there Mr Hopper - really racking them up now. I too saw that "standing stone” on the west flank of Bienn Bhrotain. It looked to me that someone had put the stone in this position and then packed rocks round its base to keep it upright. As for the b****** midges they are the main reason I don't go on our walking club meets to the west coast during the summer. We still get them here in the east but [usually] not in so great a number. Looks like this has been an exceptionally bad year for this blight. Hay Rockhopper, you are doing some mega walks lately this being one of them. Top class effort. Some good photos on a big round. Shame about the midges hahaha.